Whether you’re a first-time home buyer or you’ve been down this road before, it’s important to take a look at all your home financing options. Why? Because what worked for you before may not work for you now. And while your peers may all choose a particular type of loan, they aren’t one size fits all. When it comes to buying a home, take the time to learn the lingo, figure out what you want/need, and explore the home financing options available before settling on a type of loan. Before we dive into how to choose a loan and home financing options, let’s make sure we all understand the terminology— with a little help from the experts at Veterans United. Mortgage: debt secured by the collateral of specified real estate property that the borrower is obliged to pay back with a predetermined set of payments. Mortgage interest: the interest charged on a loan used to purchase a residence. Mortgage interest is charged for both primary and secondary loans, home equity loans, lines of credit, and as long as the residence is used to secure the loan. Mortgage interest is deductible on taxes. Mortgage insurance: an insurance policy that protects a mortgage lender or titleholder in the event that the borrower defaults on payments, dies, or is otherwise unable to meet the contractual obligations of the mortgage. Private Mortgage Insurance: Private Mortgage Insurance (PMI) is a special type of insurance policy, provided by private insurers, to protect a lender against loss if a borrower defaults. Most lenders require PMI when a home buyer makes a down payment of less than 20% of the home's purchase price – or, in mortgage-speak, the mortgage's loan-to-value (LTV) ratio is in excess of 80% (the higher the LTV ratio, the higher the risk profile of the mortgage). ARM: a type of mortgage in which the interest rate applied to the outstanding balance varies throughout the life of the loan. Normally, the initial interest rate is fixed for a period of time, after which it resets periodically, often every year or even monthly. The interest rate resets based on a benchmark or index plus an additional spread, called an ARM margin. ARM Margin: a fixed percentage rate that is added to an indexed rate to determine the fully indexed interest rate of an adjustable rate mortgage (ARM). Adjustable rate mortgages are one of the most common variable-rate credit products offered in the primary lending market. Fixed-rate mortgage: a mortgage loan that has a fixed interest rate for the entire term of the loan. Generally, lenders can offer either fixed, variable, or adjustable rate mortgage loans with fixed-rate monthly installment loans being one of the most popular mortgage product offerings. APR: the annual rate charged for borrowing or earned through an investment, expressed as a percentage that represents the actual yearly cost of funds over the term of a loan. Home Equity: the value of the homeowner’s interest in their home. In other words, it is the real property’s current market value less any liens that are attached to that property. This value fluctuates over time as payments are made on the mortgage and market forces play on the current value of that property. 2) Know what you need. 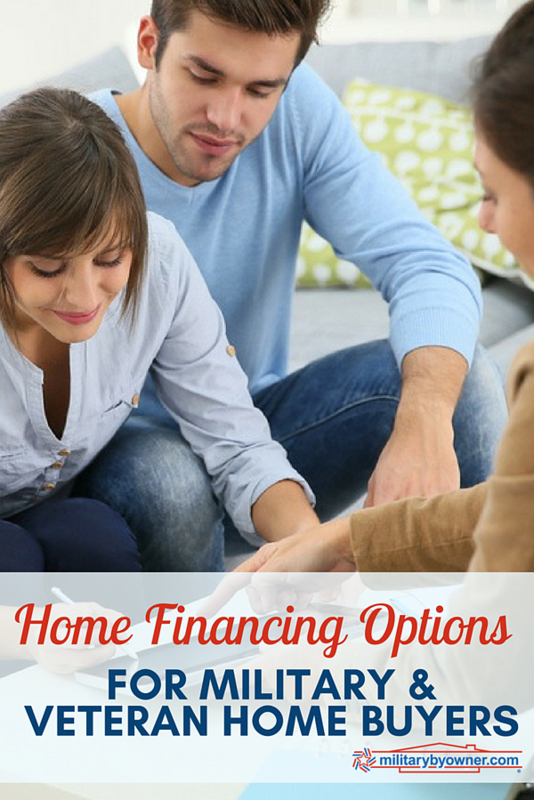 Before you look at specific home financing options, you need to know how to choose a loan that’s right for you. As you start thinking about buying a home, make sure that your credit is in order so you can open the door to better financing options. However, there are financing options available if your credit score isn’t shining its brightest— but we’ll get to that in a minute. Now, think about what you can afford. If you’re active duty military, review your BAH and decide how much of that you’re willing to put toward a mortgage. If you know you that you’ll rent the property when you leave, make sure that you can afford to list it at a competitive price for potential tenants. If you’re looking for homes within a specific financial bracket, decide how much you’re willing/able to put in a down payment. Then ask yourself how long you want to make payments on the house. Do you want a fixed-rate mortgage or an ARM? If you're not sure, read Pros & Cons of an Adjustable-Rate Mortgage. Once you have an idea of the terms you’d like in your mortgage, you can start looking at home loan options and find the one that best suits your financial needs right now. 3) Explore your financing options. Now that we know what we’re looking for, let’s explore the VA Home Loan as well as a few other home financing options to find what works best for you. The VA Home Loan is known for its competitive interest rates and the no down payment option for veteran and military home buyers, and some family members. Active Duty members with a statement of service. Veterans with the Certificate of Release or Discharge from Active Duty Form DD214. Spouses of military members who’ve died on Active Duty or as a result of a service-connected disability. Since the loan is backed by the Department of Veterans Affairs, you won’t need to pay PMI fees. Since it’s a government-backed loan without the requirement of private mortgage insurance, there are lower limits on the loan amount. This wouldn’t be a good home financing option for you if you’re looking for a home outside the VA loan financial cap. A USDA loan is a great option if you’re looking to buy a home or land in a rural area. The loan is designed to help home buyers in a lower financial bracket. You must fall within a set financial bracket. Must have the ability to repay debt. The property must be within a predefined eligibility zone. The amount that a qualifying applicant is approved to borrow is dependent on ability to repay the loan and determined on a case by case basis. Gift funds available to cover closing costs. The loan interest rate is based on current market rates at loan approval or loan closing, whichever is lower. The interest rate, when modified by payment assistance, can be as low as 1%. Home buyers have up to 33 years to pay back the loan or 38 years, for qualifying applicants. The amount that a qualifying applicant is approved to borrow is dependent on their ability to repay the loan and determined on a case-by-case basis. You’re limited to buying a home in a USDA predefined zone. The Federal Housing Association is part of HUD and helps qualifying home buyers get a great deal when it comes to buying a home— especially if you’re a first-time home buyer. Must have a credit score of at least 500. You can include the cost of energy-efficient updates under an FHA Energy-Efficient Mortgage. Eligible first-time home buyers can make a down-payment as low as 3.5% of the purchase price. Gifted funds can help cover closing costs. Offers financing options for mobile homes and factory produced housing. They don’t offer 100% financing. Since FHA loans are considered higher risk, mortgage lenders want an upfront and monthly premium on any portion of the mortgage that exceeds 80% of the home’s value. So, if you don’t put more than 10% down initially, you’ll likely pay mortgage insurance for the entire length of your 30-year note. Conventional home loans aren’t backed by the government, so they’ll likely require a higher down payment accompanied by private mortgage insurance. A conventional loan is a great option if you don’t meet the eligibility requirements for other loans and you have great credit. With a higher down payment required upfront, the home builds equity quicker. More freedom to negotiate terms and conditions than a government-backed loan. Fewer restrictions on property and eligibility requirements. They’re typically offered in 30- or 15-year notes and have lower interest rates. If you can afford to put 20% down, you can avoid PMI altogether. Higher down payment requirement, which can make it difficult to get a conventional home loan. You need good credit to qualify. Lower credit means more risk for the lender and higher interest rates for you. A conventional loan benefits you the most when you can pay off the loan within the shorter time frame and spend less money on interest. As you move forward into buying a home, use these steps to guide you in the right direction. Then, talk to a professional military-friendly lender who can help you figure out the best home financing option for you and your family. Looking for more home buying tips? Download MilitaryByOwner’s free ebook, What to Know About Your Finances Before Buying a Home.